Judging by the increased use of photo radar throughout Tucson, it's pretty safe to say that everyone feels the need for speed occasionally. As someone who recently got snagged by an ominous white van parked on the side of our road, I tend to agree. Of course, I'm also an avid motorsport fan, and I'll watch pretty much any racing that I come across on TV that involves the horseless carriage. However, I know that speeding and city streets don't mix, so I don't usually speed in town. It's just not safe (and of course I'm not advocating it). What I will do however is buy a small car for a specific purpose: the enjoyment of simply driving. In January I summoned a friend and the courage to visit Sierra Auctions in Tucson. What lead me there was a year long search for the perfect simple motorsport car. It turned out that was a black, mid-nineties Mazda Miata (pictured above) for a great deal. Auctions can be fun and exciting. Auto auctions even more so. Within 20 seconds of furious hand waving, it was mine. "Dude, you just bought a car!" Eva and I have taken the car on several drives, as far as California on one occasion, but this September we began auto-crossing it at the Pima County dragstrip, an event organized by the Arizona Border Region SCCA club. You don't need to have a sports car however. You can race pretty much anything in autocross as long as it has working seat belts, nothing is falling off, the tires aren't bald, it's not leaking any fluids, and it's not stuffed with a bunch of stuff you keep forgetting to take to Goodwill. Helmets are provided, but Eva and I decided we'd make a semi-permanent investment and buy our own at Play-it-Again Sports. Be careful to pay attention to the helmet rating if you go this route, as only specific helmets will qualify. And anywhere your helmet isn't covering, slather on some sunscreen. 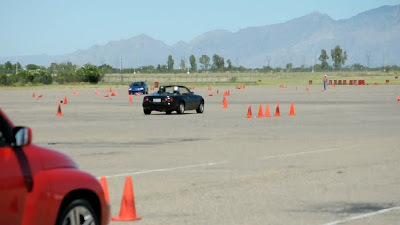 Autocross is a simple form motorsport involving a parking lot, timing lights, and a truckload of cones and organization. The tracks are laid out differently every month, so everyone has to learn the track on the day of racing, which is probably the most difficult and surprising part. Events are run/work, which means you race three to four quick heats and then work three to four, and only cost $35 to $40 for non-members. Working simply involves knowing a few flag and hand symbols, watching for hit cones and course deviations, and manning a walky-talkie or fire extinguisher if needed. When you go, make sure you bring some water, some lunch, and even more sunblock. Even if you don't participate, you can still have alot of fun by riding along with experienced drivers, sometimes in pretty exotic and rare cars. After having a couple of course deviations (a 20 second penalty), I rode along with a veteran in a modest looking Subaru. I thought I knew what fast was: the ride blew my mind and I didn't even have to pay a fine. Text by Andrew Haberbosch exclusively for Tucson Querido.